I can certainly relate to Eddie Izzard’s joke about pears. Two pears are in a basket on a counter in the kitchen. A person is close by and the pears are whispering to each other about not turning ripe enough to eat. The person checks the pears and then leaves the room. The pears immediately rot. It is pretty much like that with figs. In order for figs to taste their absolute best, they need to ripen on the tree. If you don’t get them fast the birds eat them. When you buy them at the store often they are already too ripe and by the time you get them home you have to throw half of them away. Or, you get to the store and there are none left because the season is so short. In a large mixing bowl, whisk the flours, sugar, and salt to combine. Add the butter and blend until the mixture is the consistency of coarse cornmeal. Adding a tablespoon of water at a time, continue to fold the flour mixture until it comes together in a ball. Don’t overwork the dough. Mold into two disks and put in the refrigerator for 1-2 hours. While the dough is chilling, wash the raspberries and set aside to dry completely. Quarter the figs and set aside. Mix the almond flour with 2 tablespoon of sugar set aside. with feta and honey. You can grill them and then drizzle the tops with balsamic vinegar. You can cook them with some oil and garlic and toss them with pasta. There are also many fig desserts. One of my current favorites is in a galette. 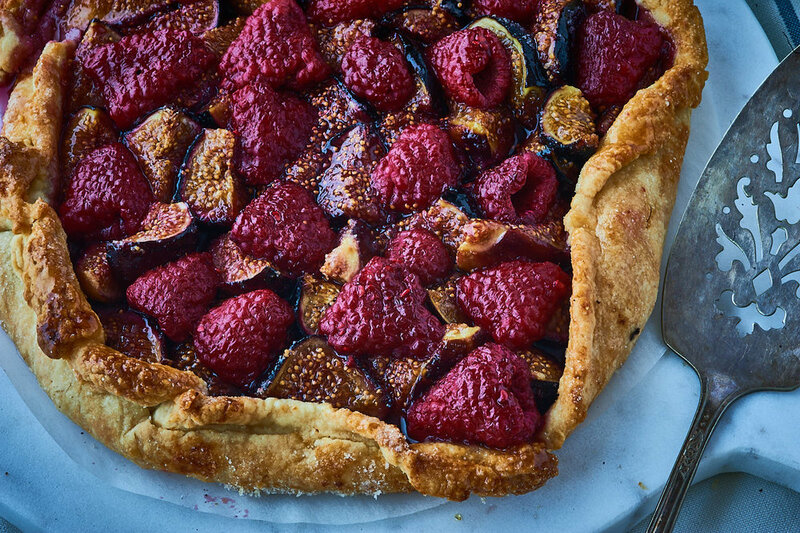 One bite of this galette with sweet figs and the slightly tart raspberries will make you a fan too. This galette won’t last long and I guarantee you won’t throw it away either. Note: Read the whole recipe before you start. The dough makes enough for two galettes, and it needs to rest in the fridge for at least 1 hour. In order to get the correct texture for a galette you will need to roll out the dough and chill it for 30 minutes before you fill it. Place a piece of parchment paper on a cookie sheet. Roll out the dough into roughly a 10”-12” circle. It doesn’t have to be a perfect circle because you will be folding the dough and cutting off pieces that are too long. Place the dough on the parchment paper (I find it easier to roll the dough back on to the rolling pin and then transfer it over to the parchment paper). Put back into the refrigerator for 30 minutes(see note). figs. Then brush the dough lip with your beaten egg white and sprinkle the last of the sugar over it. Bake for 35 minutes. The figs should start to release their juices and collapse a bit. Now add the raspberries snuggling them in and around the figs. Put the galette back in to the oven for another 10-12 minutes. Place it on a cooling rack. Warm the honey in microwave or saucepan until it is really runny and then lightly brush it on top of the fruit, especially the raspberries for a light, shiny glaze.